Kuzhbiyi is non-residential village in Mezhyhirsky district of Zakarpatty Region, Ukrain near mountain village Sojmy, 2,498 feet (750 m) above the sea level, and wherein only two people live today. In 1930’s there were about a dozen yards. Today there is only a wooden two-logs-based church, topped by three crosses, and several ruins of houses (burned by modern barbarians). The Church looks well-groomed inside and neat, but the locals say that its roof is leaking much during rains. On the wall of the church visitors can see granite plaque with inscription (in Ukrainian): The Orthodox Church of Assumption of the Holy Mother was built in 1937. 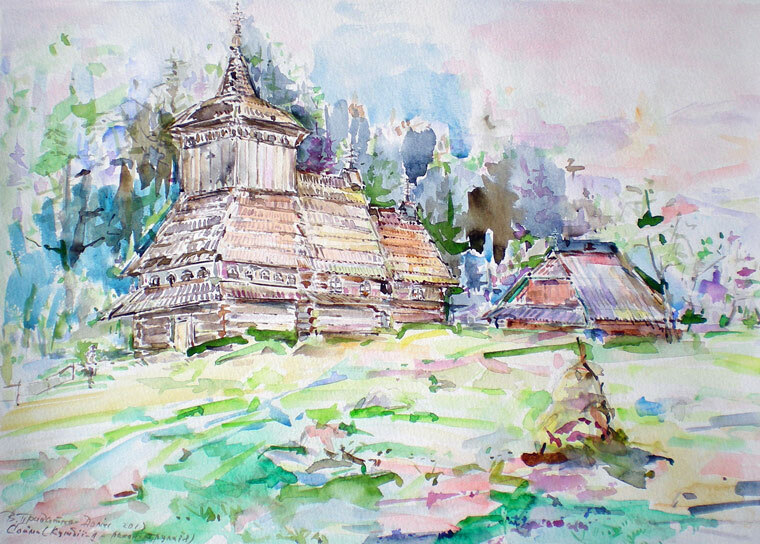 In the valley of two rivers Rica and Repinka, in Soimy, there is a ‘sister’ of the Kuzhbiyi church, which is based on three-logs-construction. But it has been decorated last years by gloomy plastic and iron. In scope of local stories the both mentioned churches were built by the same priest-and-architect. 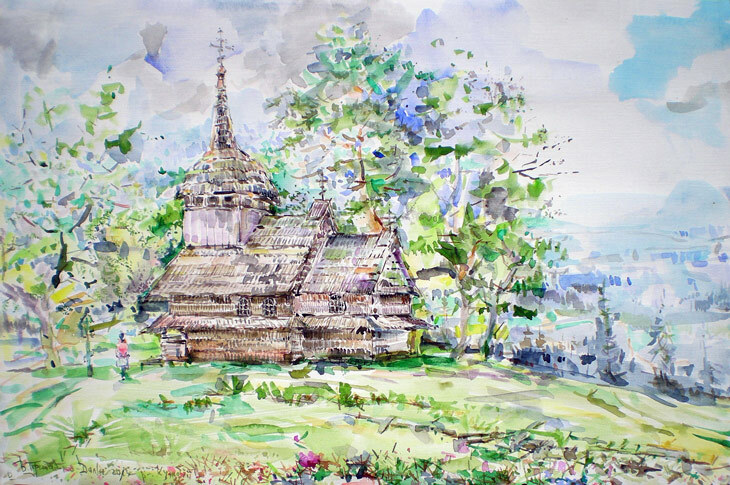 The stories gave me a chance to remodel primary view of the Sojmy’s church using watercolor illustration. 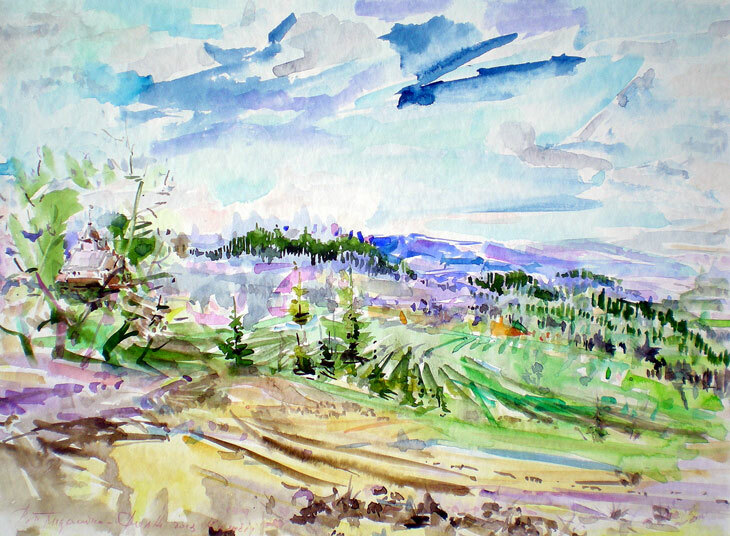 The relatives of the priest-and-architect (with whom I was able to talk this summer during my en plein air) confirmed kindly that: ‘it looks like it was!’ So, I would like to present at the web-page my new watercolors related to this beautiful area Kuzhbiyi. 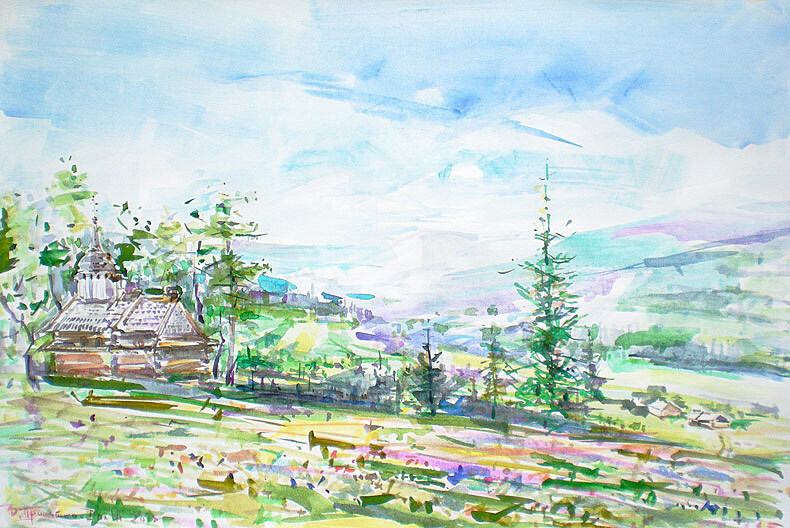 See other new watercolors of this Carpathians summer season.